This recipe is a close adaptation of Martha Rose Shulman’s recipe for the New York Times. I actually had the pleasure of meeting her last week (#starstruck), because she’s moderating a panel at an upcoming conference that my company is hosting. Our lunch meeting was catered by SweetGreen, so basically it was an all-around perfect day. In my version of the recipe, I decided to lighten things up a little bit and bake the patties, rather than coating in breadcrumbs and pan frying them. 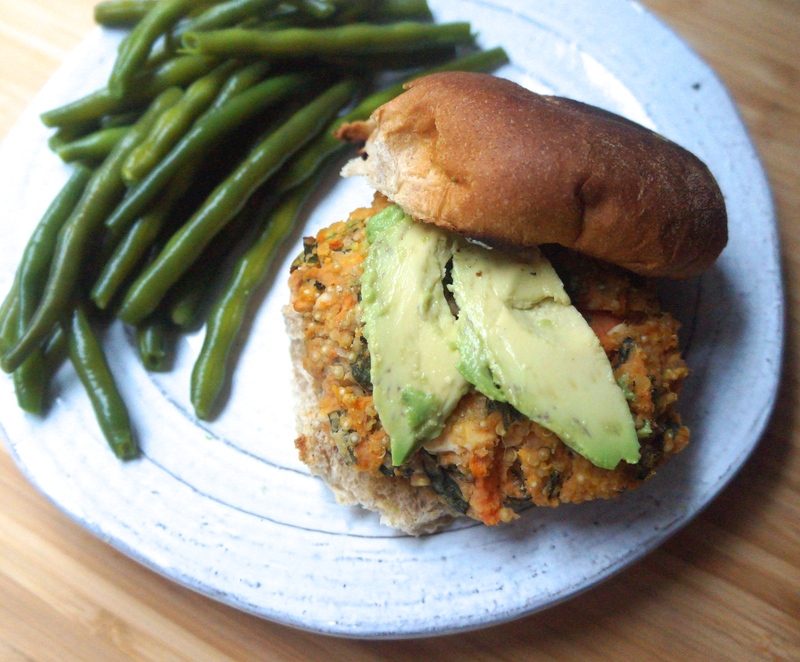 Shulman recommends serving the patties with raita, chutney, or a garlic mint yogurt sauce, but I went classic veggie burger style, and served them up on toasted whole wheat buns with avocado slices and fresh spinach. 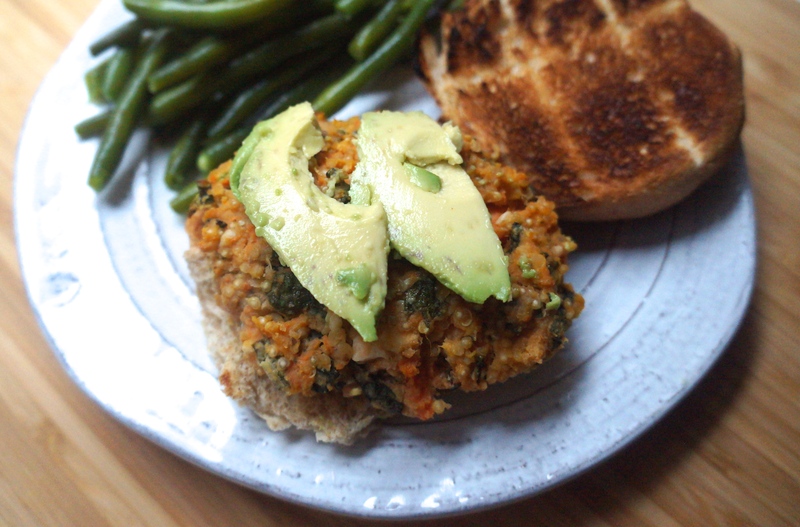 My only previous attempt at veggie burgers was an awesome black bean burger recipe (with avocado mango salsa, might I add), so this was a totally different experience. But a delicious one, at that. The feta and chives really give these veggie patties a flavorful kick, and the lentils and quinoa provide that ever-important protein. My boyfriend was actually licking the bowl at this point. I’m telling you, these veggie burgers are GOOD! Combine water, quinoa, and lentils in a small pot and bring to a boil. Then cover and reduce to a simmer, until the outside germ of the quinoa separates into a curly tail, the lentils are tender, and the water has been absorbed (about 15-20 minutes). While the lentils and quinoa are cooking, skin the potatoes and place them in a large mixing bowl. 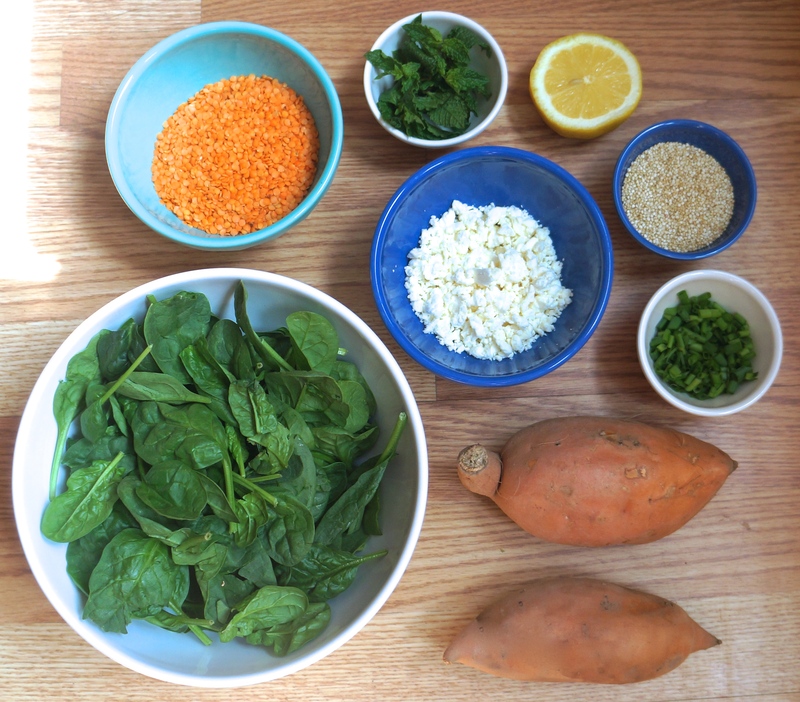 Then add the spinach, feta, chives, mint, and lemon juice to the sweet potatoes. 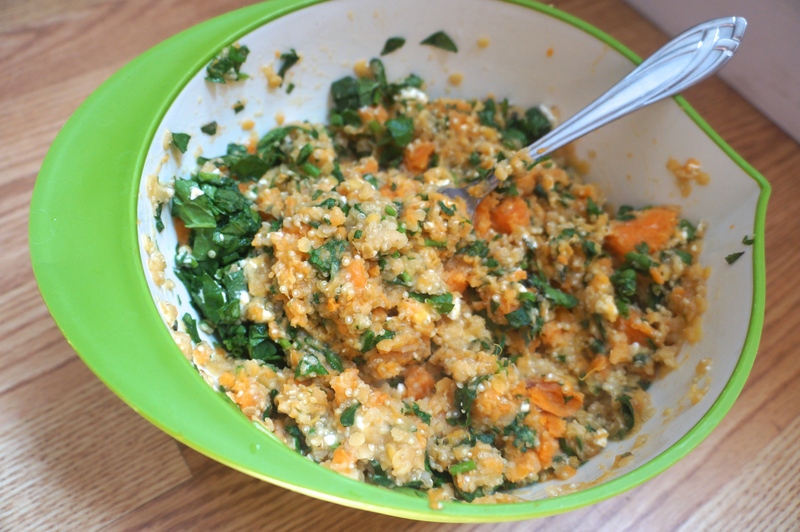 Once the lentil and quinoa mixture is cooked, let cool, then add it to the sweet potato mixture. Mash all ingredients together with a fork until mixed well. Line a baking sheet with parchment paper. 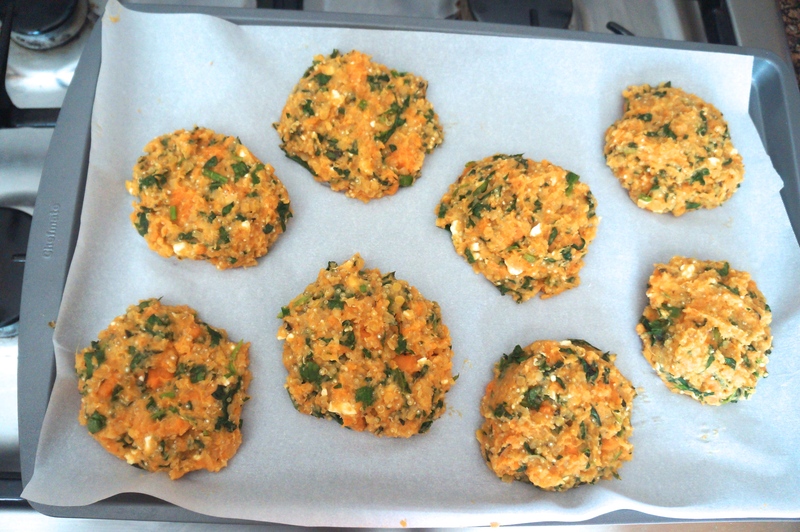 Scoop ½ cup of the vegetable mixture, then roll and flatten into a patty. Continue with the rest of the mixture. Recipe makes 8 patties. Bake at 350 degrees F for 25 minutes (no need to flip). 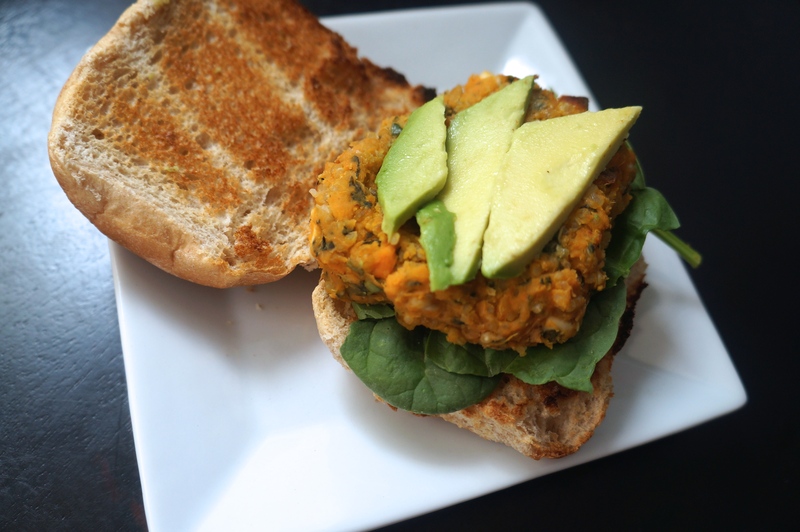 Serve on a toasted whole grain bun with fresh spinach and sliced avocado. Worried about arsenic in rice? 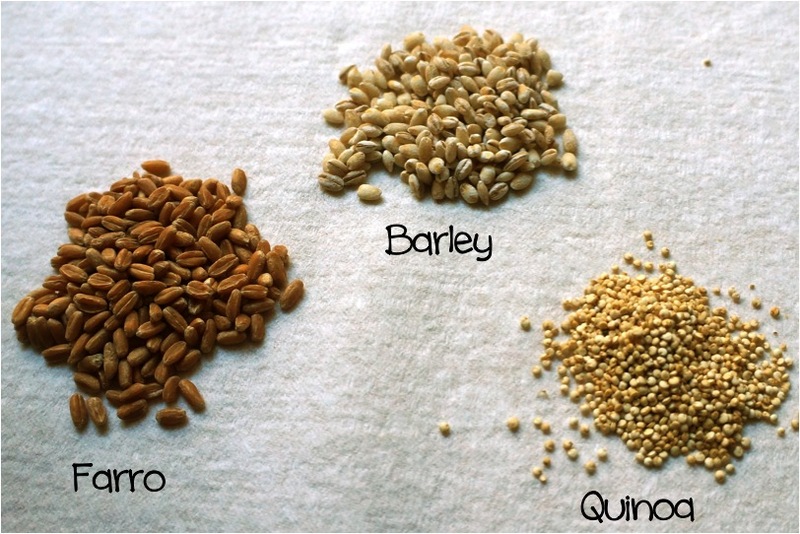 Substitute one of these healthy grains! In light of recent arsenic scares, the Consumers Union recommends no more than 1/4 cup rice (dry) two times per week for adults, and 1.25 times per week for children. (This recommendation applies both to brown rice and white rice.) Do you rely on rice as a dietary staple? If so, this is the perfect time to branch out and try other grains. Out of all of the grains available, I find that farro, barley, and quinoa are the most “rice-like” and work best as rice substitutes. Farro: Farro is an ancient strain of wheat (meaning it’s not gluten-free, for any allergy folks out there) and the grains are a tad larger than rice. Farro has a chewy texture and nutty flavor, similar to brown rice, but turned up a few notches. Because of this unique flavor, farro works well as a stand alone side (fish served on a bed of farro, chicken with a side of farro, etc). Also, farro’s texture lends itself well to grain salads. It stays chewy when served cold, unlike rice, which becomes dry and stale. At the grocery store, look for whole farro (rather than pearled farro) to be sure you’re getting a whole grain. Barley: Barley (wheat free, but not gluten free) is a bit smaller than rice. It has a neutral flavor, so it works great in mixed dishes (such as stir frys). It is also great in soup (think beef with barley!) and works well with beans. Like rice, it is best served warm. Look for whole barley or hulled barley at the grocery store. While pearled barley is more nutrient dense than a fully refined grain, it is not technically a whole grain because part of the bran has been removed. Quinoa: Quinoa is like the chambray shirt of ancient grains… it goes with everything! Even though quinoa is actually not very “rice-like” compared to farro and barley, this tiny, gluten free pseudograin can be substituted for rice in many recipes. Warm or cold, sweet or savory, quinoa can be whatever you want it be! What is your favorite grain to substitute for rice? While many Americans are struggling with obesity and overeating, there is still a significant portion of the population that is looking to put on weight. Sounds easy, right? Load up on junk food, and you’ll hit your calorie goal in no time. But surely there has to be a healthier way. Many people were shocked to learn that Olympic gold medalist Michael Phelps had to consume roughly 10,000 calories a day in order to keep up with his strenuous training schedule. 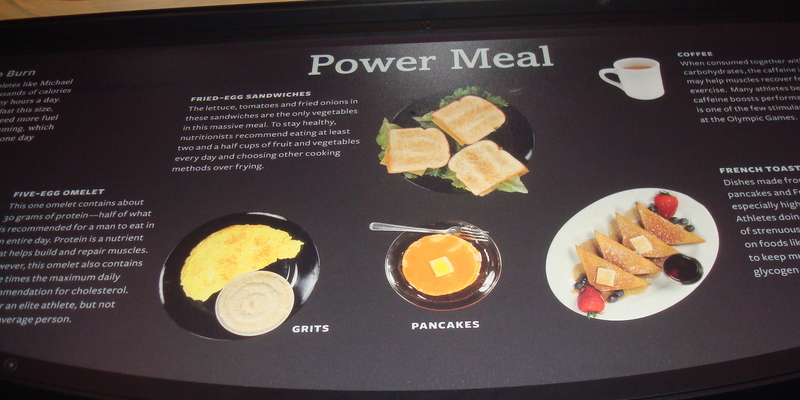 His meals consist of mostly high fat, energy dense foods. 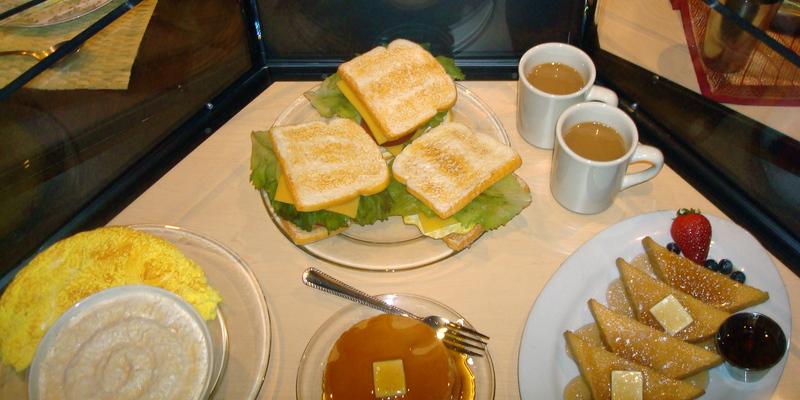 See his breakfast below, on display at the American Museum of Natural History through August. While this doesn’t appear to be the healthiest diet, there is no doubt that eating 10,000 calories of fibrous fruits and vegetables would not only require a lot of eating (those are low calorie foods) but also likely cause intestinal turmoil (too much fiber… way too much fiber). That being said, there has to be some middle ground. Here are some of my top picks for healthy foods that are energy dense AND nutrient dense. So what what kind of breakfast would I recommend for someone looking to add more healthy calories? And if you were burning as many calories as Michael Phelps, I might recommend that you eat all of these things together 😉 What foods do you gravitate towards when your body needs energy?